I have acquired a Mint in the Box Apple IIc Computer System that has apparently never been removed from the boxes. The system belonged to a lady who can't remember where she got it from decades ago, and it was sitting in a closet until she decided to put it in her antique mall booth. The system includes the IIc, sealed monitor, monitor stand and AppleWorks software. All boxes are completely sealed and look as if they were just shipped from Apple. The AppleWorks is still perfectly shrink-wrapped. 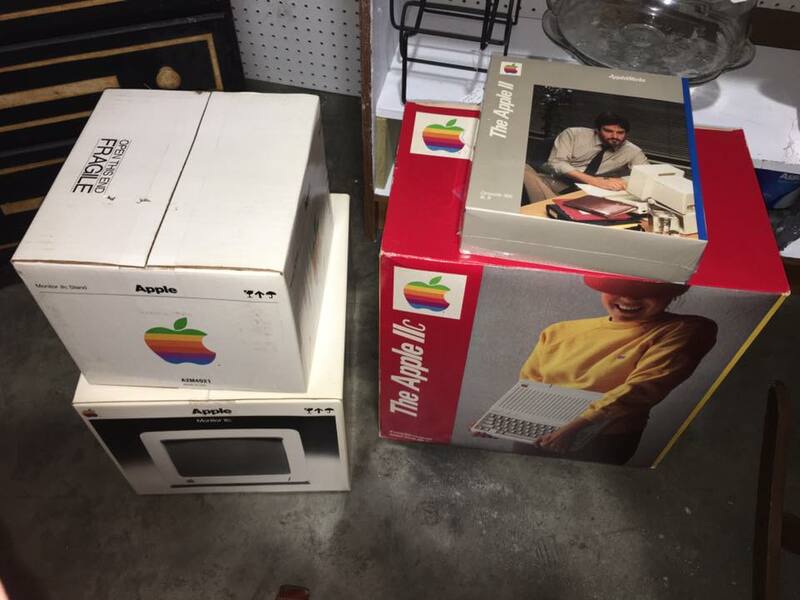 The Apple IIc box is not taped on the outside and has conventional flaps for closure; however, the corrugated cardboard box within is taped and sealed as one can see in the photos. Putting my iPhone camera (Thank you Steve) in the slots of the box handle, it appears that some dust has migrated onto the exposed surface of the IIc. There are also a few blemishes on the IIc box, and a few tears are also present on a couple of corners, but for the most part the boxes are immaculate, and quite displayable. I am absolutely in awe every time I pass by this system as it sits proudly on my dining room table. I personally will not violate the boxes to see if everything is operable, nor will I try to repair any of the blemishes. While this beauty is in my possession it will be handled with extreme care and respect. As I type this post I am actually enjoying watching a documentary about Steve Jobs! I really hate to have to deal with selling this system on EBay, so please let me know if you are interested in this iconic piece of Apple History in a very rare mint condition. It looks like it was torn open. Have no earthly idea...all I know is the history I've been told and from what I can see. Nothing looked to be torn on anything I could see, but maybe pulled back a bit. I am fairly certain that all is mint, but I do not have any proof, and don't want to risk even pulling the corrugated cardboard insert out to inspect. Everything looks so crisp and new that it's surreal! You would do better if you cleaned it up. Looks like a nice unit, but no one knows for sure. I don't think it's as important that you don't remove the tape as it is being clean. My opinion for what it's worth, which isn't much. I may try sliding the corrugated insert out of the sleeve and inspect top and bottom tape in box. Interior box appeared to have been opened, and tape put back, but all appears to be sealed up inside. Manuals are shrink wrapped, software packaged up in plastic container, all cords appear to be twist-tied and never removed from foam. The //c doesn't appear to have been used or started up. Since the tape on corrugated box looked to have been removed on bottom, I didn't feel that I was doing any more than it's original owner, so I carefully warmed it with a hair dryer and loosened it for removal. It is absolutely magnificent...the box is dated 5/14/84!